Sen. Joe Manchin, D-W.Va., arrives at the chamber for a procedural vote to advance the confirmation of Supreme Court nominee Brett Kavanaugh, at the Capitol in Washington, Friday, Oct. 5, 2018. Manchin left the Senate chamber during the procedural vote until Republicans Susan Collins of Maine, Jeff Flake of Arizona and Lisa Murkowski of Alaska made their decisions. Collins and Flake voted to move Kavanaugh’s confirmation forward while Murkowski did not. Manchin then returned to the Senate floor and also voted to end debate and move forward. He then announced his support for Kavanaugh following a floor speech from Collins, who said she, too, will cast a final vote in his favor. Manchin referenced protests at his Charleston campaign headquarters and his Washington, D.C. senate office where women shared their experiences as voting of sexual assault. “From the start of this process, I promised my constituents that I would look seriously at Judge Kavanaugh’s record and cast my vote based on the facts I have before me and what is best for West Virginia. 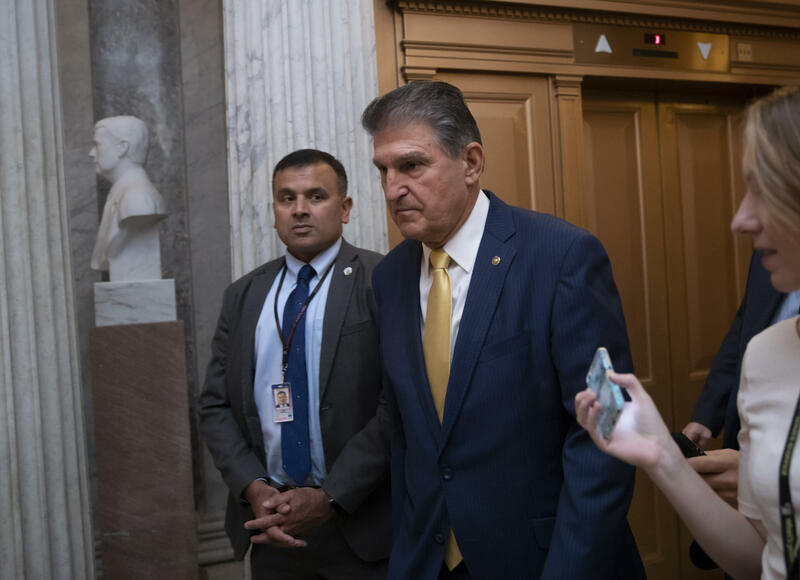 I met with the nominee for over two hours, attended his hearings, spoke with constitutional experts, and heard from thousands of West Virginians,” Manchin said in a statement Friday. Nine women were arrested for trespassing early Tuesday morning at his campaign headquarters in Charleston. “I have reservations about this vote given the serious accusations against Judge Kavanaugh and the temperament he displayed in the hearing. And my heart goes out to anyone who has experienced any type of sexual assault in their life,” Manchin said. “However, based on all of the information I have available to me, including the recently completed FBI report, I have found Judge Kavanaugh to be a qualified jurist who will follow the Constitution and determine cases based on the legal findings before him. I do hope that Judge Kavanaugh will not allow the partisan nature this process took to follow him onto the court,” he added. The longtime West Virginia Democrat is up for reelection in November. His opponent, Republican state Attorney General Patrick Morrisey, has attacked Manchin repeatedly for holding out on how he will vote for Kavanaugh. "Joe Manchin only votes in the interest of Joe Manchin. President Trump had all the votes he needed to confirm Judge Brett Kavanaugh, but Manchin waited - making a craven political calculation - in order to try to save his political career," Morrisey said in a statement -- issued moments after Manchin announced his support for Kavanaugh. "Spending months on the sideline, Manchin allowed Senate Democrats and the liberal media to orchestrate a resist and obstruct circus to smear President Trump's Supreme Court nominee. Manchin owes West Virginia an apology for watching, doing nothing, as Democrats sought to destroy Judge Brett Kavanaugh," Morrisey added. A final vote on the Supreme Court nominee is expected Saturday.